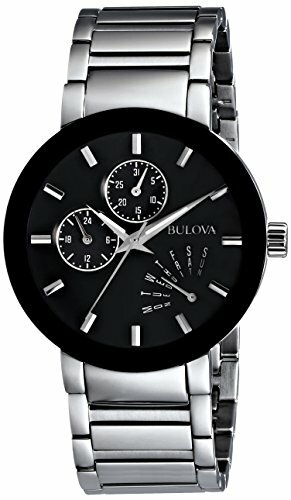 Bulova Watches Review I Are Bulova Watches Any Good? The Bulova watches review in this post is a comprehensive and accurate detail or information every watch freak will love to read. 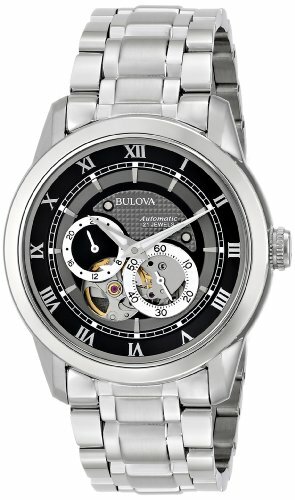 Bulova brand was created in 1875, and since then it has become one of the longest quality watch brands in the world. It gets popularized and has received international recognition all over the world for being a brand that suits everyone’s budget irrespective of what they are in search for. 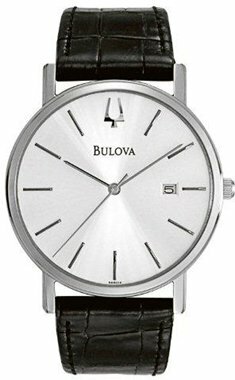 Bulova watches are manufactured with quality materials to give an elegant end product that meets the need of every watch lovers in the market. It add to one’s fashion sense and kh the peeps you updated with the present time. Most of the products from the brand is a perfect fit for any occasion be it formal or social and to make a decision on any, there are things which you must consider. One important aspect of every watch is the size. Buying a bigger watch that is too big for your wrist is A wrong decision. Albeit, it is a trend act today to put on bigger watch, but it makes no sense in having a watch on your hand that doesn’t fit. So it is advisable that you opt for the one that will fit your wrist and stay firm. It is a vital part of the watch to consider, and it comes with different options such as steel bracelet, leather strap, NATO strap and rubber strap. Steel bracelet appears to be the heaviest of them all while leather is the lightest. The straps do come in many colors, and design and the one you choose depends on your preference. A wristwatch is invented initially to tell the time, but stylish watches have lots of features to offer more than that, and such features include the day and date window, chronograph and stopwatch, water resistant, bezel, and telemeter. Everyone needs a watch personal wristwatch that will show his/her personality and sense of fashion. The wristwatch you have on have much to say about the kind of person you are. The type of wristwatch you have tells if you have fashion sense and shows your value and worth in the society. It is the main reason people opt for a highly expensive wristwatch. With the Men’s 38mm Classic Stainless Steel Dress Watch, you have one of the best wristwatches that can outperform other expensive ones you will see in the market. The Men’s 38mm Classic Stainless Steel Dress Watch is a premium watch that has patterned black dial which makes it great for any formal occasion. It appears with stainless steel case and bracelet with three hand movement and sticks indices. It has calendar window and date at 3 o’clock position of the watch. The Men’s 38mm Classic Stainless Steel Dress Watch is a very strong watch, and yet a smart timepiece that will fit every man’s wrist out there because it comes with a standard size and you can choose to remove some bracelet to get it fitted. It has two good years warranty, and you can always return if need be. Design: It has a simple design with static bezel, black dial, the crown is silver, and it can be used to control the time. Price: It is fairly expensive but affordable for every watch lovers in the market. 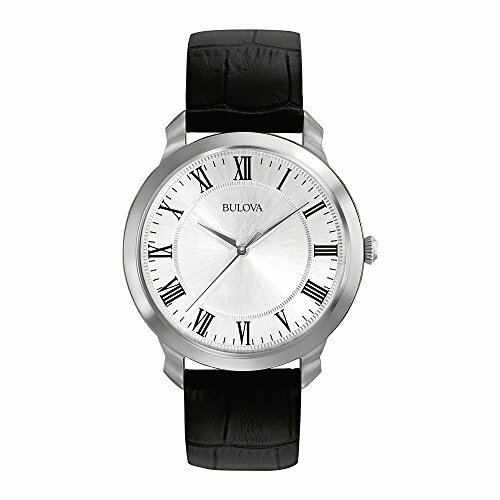 The Men’s 96C105 Black Stainless Steel Watch Obviously looks different from every other Bulova wristwatch in design. It has an amazing feature which makes the watch irresistible for everyone out there is watch enthusiast. The Men’s 96C105 Black Stainless Steel Watch has an exceptional dial that is large and round and jet black. It is so glaring that the black dial of the watch gives it a sparkling look with the baton indexes having undertones of silver. Not to talk of the luminous hand that enhances visibility in the dark, it has the date displayed innovatively within the 3 o’clock and 4 o’clock positions. The watch also has two sub-dials which are placed to display time as well as the 24 hours based clock. The face of the watch is protected with mineral crystal coating while the bezel is black with a touch of white. It is an essential bracelet with for every man out there since the watch is specified to be used by men. It has quality features which will announce your fashion style and sense wherever you appear. The crown is used to controlled and set the time without hassles. Design: The watch is well constructed to meet the need of every watch lover. It is an analog watch with Japanese quartz movement, while the stainless steel bracelet has deployment clasp closure to keep the watch secured in your fashion wrist. It is resistant to water up to about 90 ft which means it can’t be submerged in water above 30 meters. Price: With the feature and design it has, it isn’t expensive for watch enthusiast. 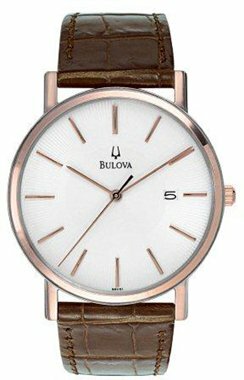 The Men’s 38mm Classic White Dial Brown Leather Strap Watch isn’t just a common watch but a classic timepiece produced by Bulova. The watch alone has caught the attention of watch enthusiast out there, and it’s alone increasing in popularity due to the sales rate. The watch is appealing to the eyes with the rose-tinted golden color in the rim which makes it pleasing to those who love simple and smartwatch out there in the market. The touch and feel of the watch are topnotch, and the leather strap makes it too difficult to overlook. It has the date window located at three o’ clock position, and it blends perfectly with the rest of the dial. The leather strap of the watch has the design of a crocodile and joins with the polished steel based case. The dial has white color and this compliment the rose gold tinted minute and hour hand of the watch. Design: The design is highly professional with amazing features. Price: It is fairly expensive and affordable. The Men’s 42mm Stainless Steel Self-Winding Mechanical Watch is a very versatile timepiece that Comes with stainless steel case, and it features black patterned and charcoal grey dial with 60 seconds and 24-hour skeletal sub-dials. The wristwatch is made in the USA and can be imported anywhere. The watch operates with Japanese automatic movement with analog display along with the protective mineral crystal dial. With the deployment clasp and push button closure on link bracket, be assured the wristwatch is secured to your wrist. It has water-resistant feature which means it can withstand rain and splashes of water and also submersion not long than 30m. The wristwatch is an analog timepiece, and it can only be powered by the movement of the user. It simply means that it doesn’t use batteries but works with automatic technology. Once you have it off your hand for a longer duration of about 6 to 8 hours, the watch is likely to stop working, and by so doing, you will have to reset the time using the crown of the watch. It has an hour and minute hand and the dial is in roman numerals. The bezel of the watch is stationary, and the stainless steel case is strong enough to hold the band and bracelet through the lug. The Men’s 42mm Stainless Steel Self-Winding Mechanical Watch is a timepiece that can be used anytime for a different occasion. With its luxury look, it will enhance your overall outfits. Price: It is fairly expensive but still affordable for those who have it on top of their priority list. The next on the list is the Men’s 96A133 Dress Watch. It isn’t just called a dress Watch for fashion sake but for its value and how it compliments different dress code. It is a perfect gift for friends and family who loves wristwatch. The wristwatch is made of quality materials, and this allows it to gain more attention in the market over some expensive wristwatches. It is made in the USA with the case diameter of 41mm; the case is made of steel with the lug holding on to the leather band. The leather is made of calfskin, and it is black. The case of the watch is made of steel while the bezel is stationary. The watch works with Japanese quartz movement and has an analog display. It has protective mineral crystal dial window with a silver-tone dial, and it features stainless steel case and buckle. The wristwatch has waterproof features, and that makes it withstand rain and water splashes but not ideal for submersion. The crown is easy to control in setting the time, and the watch can be used by anyone. Design: It is designed to meet the need of everyone who loves wristwatch. From the appearance of the wristwatch, you will agree to the fact that it is a wonderful timepiece which his lots of offers aside from telling the time. The design and structure of the watch are gorgeous, and that makes it too unreal to overlook for watch enthusiast out there. The setup of the watch is amazing, it adds to your fashion sense and boosts your value in the society. 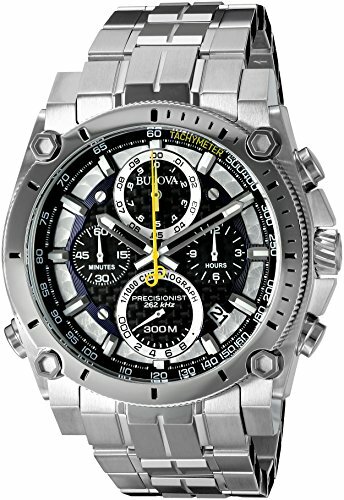 The Men’s 47mm Precisionist Stainless Steel Chronograph Watch comes with a stainless steel all over its body from the case, the bezel, and the strap or band. This doesn’t mean the watch is heavy and it shows no sign of discomfort from those who have the watch in possession because it is made of quality lightweight materials. The wristwatch has chronograph measurement or hours, minutes and seconds of 1/10-Seconds, 1/100-Seconds, and 1/1,000-Seconds. It has multiple layer black carbon fiber with blue, silver and black dial. Attractive yellow continuous sweeping second hand, secure double press over clasp with safety lock, and it has water resistant feature up to about 300 meters. It has steel from to control the hour and minutes hand. It is gorgeous, portable and lightweight. Quality: You need no one to tell you it is made of quality materials. The next on the list is the Mens Classic with the code 96C125. It is a simple and smart wristwatch which is very versatile and preferred by those who love to live a simple lifestyle. It isn’t a wristwatch that is lousy in design, but it as well showcases you level and fashion sense. It is made of stainless steel and bracelet that is well layered and strong, held with the case of the watch through the lug. The watch has day window located at the 12 o’clock position and the minute and hour hand can be controlled using the crown. 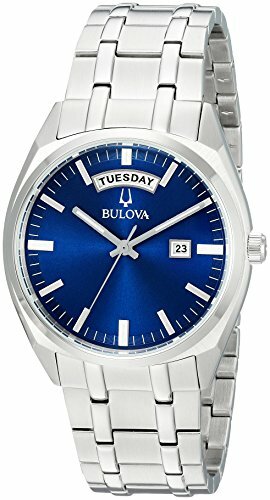 It has three hand day and date feature, blue dial with silver tone hands and markers. It has quartz movement, a bracelet that is Strong and it can be used for any occasion. Quality: The quality of the watch is topnotch. It’s such a premium wristwatch that every watch lover will fall for. Design: The design of the watch is simple, and its smartness has nothing to be compared with. Price: The price is quite low to its value, and that makes it a great deal for every watch enthusiast. 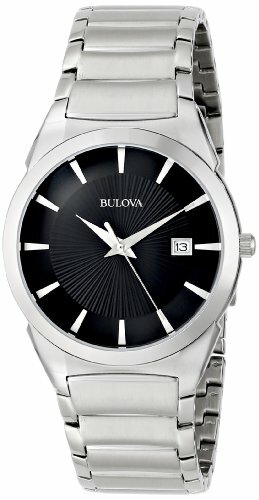 The Men’s 96B104 Stainless Steel Dress Watch is the last on the list of the top Bulova watches for this post. What a precious gift to celebrate loved ones. It has Japanese quartz movement, and the bezel of the watch is stationary with the case be made of stainless steel. The leather band is made of calfskin, and it has pocket and buckle to secure the watch in your wrist whenever you have it on. It features logoed white dial along with stick indices and date window located at 3 o’clock hand. The analog watch is very easy to understand for anyone even if it’s your first time of using a wristwatch. It is portable and can be used for different occasions. Quality: This isn’t made of lesser quality materials but high class. And that talks more about the watch and its value. 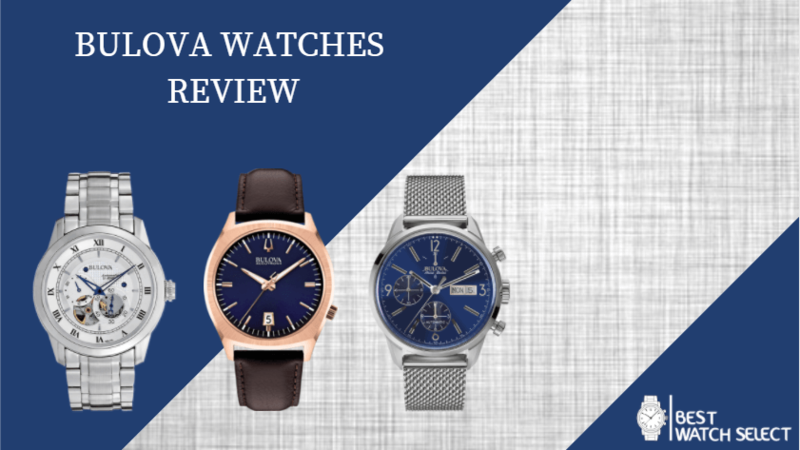 The Bulova watches review reveals all that you need to know about this reputable brand and the quality of the products they have on the market today. It is increasing in popularity with premium and gorgeous watches taking the lead among others in the list of the best watches in the market.